More than 1,500 visitors had to be evacuated from the site after the blaze broke out at Berwick Court Farm on Wednesday. Zoo keepers in Sussex are urgently asking gardeners to give them food for their pandas. The red pandas, like Mulan, can eat up to two kilograms of bamboo a day - and supplies at Drusillas Park in Alfriston are currently running low. The animals originate from the Himalayan mountains of China, India and Nepal. Mulan and her partner Anmar's diet consists almost entirely of the plant. We hear from head keeper Mark Kenward. REPORT: Giant anteater makes a splash! They're becoming increasingly rare in the wild but a giant anteater has become the latest exotic addition to a zoo in Sussex. 'Olivia' has been given a purpose-built sanctuary but, with only 5,000 of her species left, experts say its becoming imperative their natural habitats are protected. Andy Dickenson speaks to head keeper at Drusilla's, Mark Kenward. 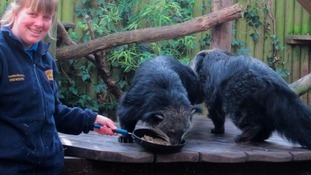 Pehn and Angkor the binturongs at Drusillas Park, Sussex enjoy their pancakes as part of their Shrove Tuesday tradition. Their savoury style crepes were created from a mixture of parsnip and pear and topped with raisins. 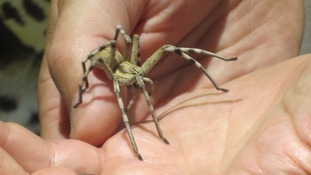 A film crew was surprised to discover a Moroccan Huntsman hidden amongst camera equipment. A critically endangered monkey has been born at Drusillas Park as part of a European breeding programme. The bouncing baby boy arrived on 18th March and is doing well under the guidance of proud parents, Kendari and Moteck; the zoo’s resident Sulawesi crested black macaques. These large monkeys are very distinctive due to their bright pink bottoms and punk style hair. They are native to the Indonesian island of Sulawesi where the population has dropped by more than 80% in the last 40 years and they are now regarded as critically endangered by the IUCN (International Union for Conservation of Nature and Natural Resources).